Thanks to jpj and Sapz for maintaining the previous scoreboards which can be found here (1.00) and here (1.01 and Arrange) respectively. Submitted scores must be from 1 credit runs - no continuing or restarting stages partway through a run. Extend and difficulty/rank settings must be set to defaults. For PCB players only: Please specify if you have triggered infinite lives. The score will be marked by an asterisk e.g. ALL*. Last edited by Plasmo on Sat Mar 23, 2019 7:47 am, edited 29 times in total. Reached the snakelasers for the first time on max rank. Amazingly missed two extends in stage 3. More to come. So apparently you can't carry more than 5 lives in stock, is that correct? Yes. You get 10k for the excess Extends. I've been working on consistency with the stage 3 midboss and can occasionally get the double Extend, which gives me a bit of a cushion for mistakes leading into stage6. Had a short stream the other day, game overed to the stage 6 boss with about C.2, started that run's stage 6 with all five Extends spare (but died early in stage 4 before the first set of snakes) and fumbled badly after the first mid boss. I've been getting killed by the left-right drone trap after the first mid a lot more recently, so either my bomb timing or my ship positioning is wrong here and needs adjustment. excuse me, but why have you taken over this thread without asking me? Videogames took my life away like the Natives during colonial times. nothing special and definitely lowest rank on the ship, but every couple days for the past week I've been throwing a few credits into arrange mode, and for the first time last night I saw stage 6 and 7. actually made it to the final boss before I panicked and died (I'd guess about 75% the way through the fight). 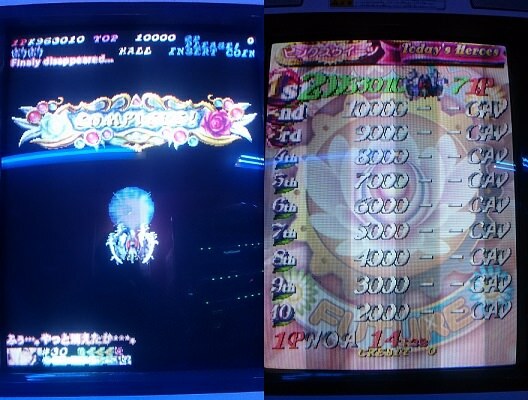 my last high score was around 40mil.. so here's to hoping for the 1CC in the next few weeks. sorry to have you update again ._. also wasn't 75% the way through the boss.. didn't realize there was a phase 2. landed a hadou right on his head and had 1 left after but couldn't manage..
Congrats on the clear! It's not a tough one in concept, but in practice I found it very easy to find myself on my last life wondering where all my resources went. Solid score as well. as far as resources go I agree. If there wasn't a 5 life and 4 gun cap it would have been way easier. I had to start planning out my guns and suicides accordingly which made it really fun. I want to keep working on a higher score but switched over to working on a mmp 1.01 clear for now. I preordered the bundle, but it took me till now to really have fun with it. Just got this game and am having quite a bit of fun with it even though it is brutally difficult. After a few days with it, got a score that I am not ashamed of. A decent increase. Breaking 4 mil will be difficult for me, as I have no good strat for stage 4 right now. Soooooo close to breaking 4 mil. Damn it all. I need to really figure out a strategy for stage 4. Got World Record, but sadly under non-default settings (extend set to every 1mil). The route I am using can be used under default settings as well. Obviously, I will not add the score in the opening post, but I still thought I would drop it here. Do you have access to a cabinet with defaults where you can go for a proper WR? Unfortunately no. But I just wanted to see how scoring works in this game anyway, so I will probably leave at this. I still want to go for a clear on the port tho. Great stuff! How close are you to breaking through the stage 6 wall? Stage 6 is indeed quite the wall! This was my first credit getting past the snakelasers. I have to admit tho, that I have yet to enter stage 6 with a full life stock. I keep messing up earlier parts due to trying to score well. However, I have a route ready and now it's down to the grind. I've had open business to do with vers. 1.00 for way too long now. I really want to beat at least Icarus' score. A clear is very, very far away as things stand now. Also, I aim to completely redo the Pink Sweets ST, as we have gained so much more knowledge through all those years - Again, mostly thanks to Icarus' fantastic work on this title! As usual, snakelasers ended the run. First time into stage 7! Specifically played offline as the replay is confidential. Interesting- is there a secret snake laser strat? Very psyched to see you make such a big leap at least? Please post video evidence for your score given your history of cheating. Unfortunately there is not. The only thing you can do is to have enough resources at that point. I'm quite happy about the progress myself. I will keep going! Starting to put the time in and get somewhat familiar with how the scoring works. Game definitely has its moments. Might take a little while for me to top this. First time into stage 6 and you've managed to get something worthwhile out of it as well! Way to go, AQY! Make it last!